A: As we know, to append link that guide to your homepage to the logo of page turning book is not only a effective promotion for your website, but also a convenient way for reader to obtain more information. 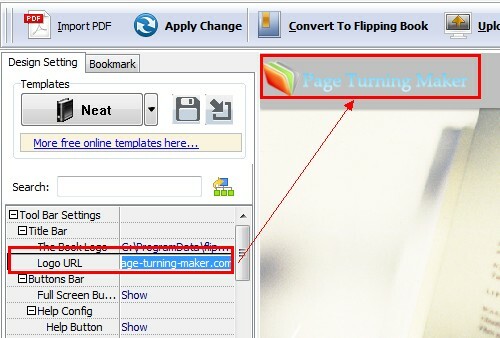 Now with Page Turning Maker software, you can easily custom your book logo and add link to logo. Next let’s go ahead to learn how to set a link to book logo. Step 1 : Run Page Turning Maker software and import targeted file. Step 2 : Turn to Design settings dialog in the left of main screen, and access to option “Logo URL”. Step 3 : Type in the URL you want it link to when click the logo. Step 4 : Choose Apple Change button to confirm your setting and preview the effect.